Just sitting there staring at a caption on Instagram and we're just not totally sure about any part of it. Okay, I guess we're sure about ONE thing: it doesn't sound like us one bit. Writing in a tone that sounds like you're just chatting on the phone takes some thought at the beginning. But it's easier than remembering to work out once you get the basics down. And, hey! That's something to be thankful for because remembering to work out and building it into your day isn't as simple as drinking a second iced mocha. I should know... I really like iced mochas. 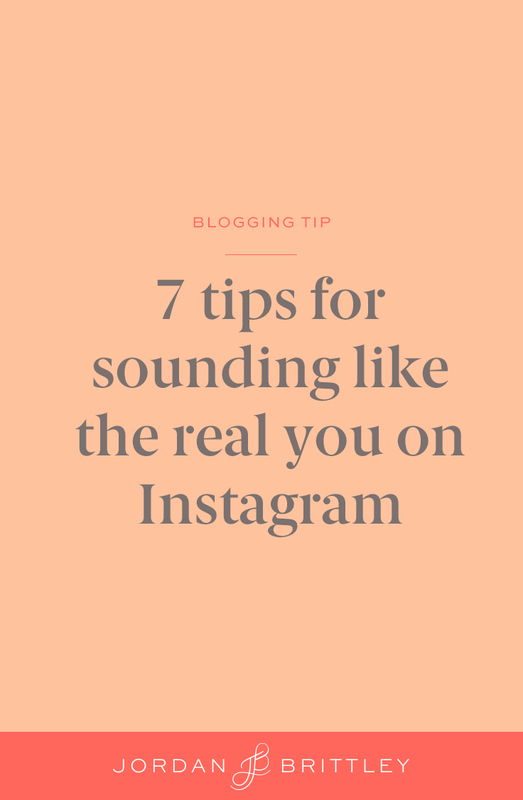 So what are these 7 gems of advice that will turn your social media captions to gold? Well, friend, I'm so glad you asked! Get to know how you really sound by using text-to-speak on your fancy little smart phone. Pull up a text message and just talk. You know those words and phrases you always say? Start jotting those words down in your Notes app or in Evernote if you're feeling fancy. But seriously. No, really. See what I did there? If we're in conversation, I'll most likely say "but seriously" or "no, really" more than once. I can't help it. They're just Jordan-isms! Negative nelly's of the world all tend to unite in our heads when we're ready to start writing a caption. Am I right or what? You've got to nix the negative voice your hear and pretend like you're just talking to a friend. 4. Brand voice or bland voice? You know that boring, paper-writing tone that made our English teachers give us a bright shiny A? It's got to go. Like right now. Just toss the "professional talk" out the window and give yourself permission to write like you talk. You need to do it, friend. And don't tell anyone I told you this, but a little glass of wine might be the best copywriting friend you ever did have. Stuck on what to post to Instagram? Here are 8 fun Ideas! You definitely want to put your commas in the right place and avoid run-on sentences, but you have so much more freedom in your writing than you did in English II in college. Go back and proof everything at the end, but punctuate as you please along the way so you can keep those creative juices flowing. I learned this little trick from Mrs. Jenna Kutcher and it's a gem. The first time I did this, I felt so awkward because... hello! It didn't sound like me at all. I felt like I was reading a robotic caption from someone who was scared to make a grammatical mistake. And well, I totally was. But. Look. At. Me. Now. I-break-rules-and-it's-awesome. If you're not a natural planner (guilty as charged), then you're going to cringe just a tad at this one. I want you to write something. And then I want it to sit there, staring at you. Wait to publish that baby until you've read it a couple times (as in... next day) and you know it is on par with your brand's voice. 4 creative ways to tell Instagram "Happy Thanksgiving!" I think we should be marketing rebels. Let's learn #thethings and then let's experiment. Break the rules and see how it goes. Hashtag that image something a little different and take a risk to see if you can get in front of an audience. Post at a "bad time." Write something that feels like emojis on steroids in a Pride & Prejudice world. See how it goes and keep testing. Because you're about to find your Insta voice and shake up the #communityovercompetition world. Name your board "Blogging Tips" so we can find your faves!